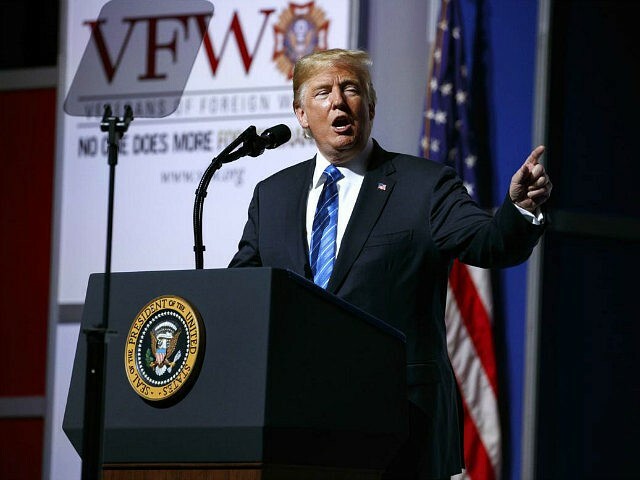 The president acknowledged that the United States was still engaged in war in Afghanistan but that they were making great progress after he removed the military restrictions for the soldiers. “They deserve rules of engagement that give them the best opportunity to finally defeat the enemy,” he said. Trump spoke about his desire to achieve world peace through American strength. “Hopefully people will look at us and say, ‘Let’s pass,’” he said, referring to America’s enemies. Trump was joined at the event by the newly confirmed Secretary of Veterans Affairs (VA) Robert Wilkie and his chief of staff John Kelly. He highlighted the important reforms in Veterans health care, including a bill he signed allowing them to choose a private doctor for care if a VA doctor was not available.